I’m not kidding when I say that I discovered Design et Nature thanks to my hairdresser David Mallet. He has decorated his fancy hairdressing salon near Place de la Victoire with ostriches and other stuffed animals from his native Australia. No wonder that many clients fall under the spell of taxidermy at his charming salon. When it happens, he sends them all to see to the nearby boutique of Anne Orlowska. 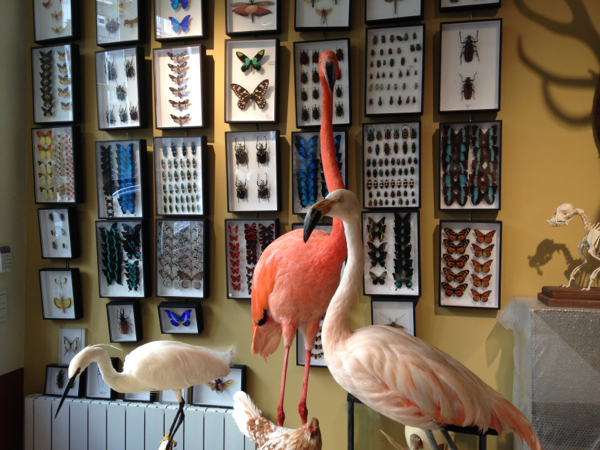 Design et Nature on rue d’Aboukir looks a bit like an enchanted menagerie: birds, beasts, bugs and butterflies. An enormous polar bear stands on his two hind legs; a toucan looks into your eyes, a fox is playing around; a peacock showing off all his beauty. It’s animal kingdom. Each one more beautiful than the last, every one dead, of course, but somehow in a way alive. 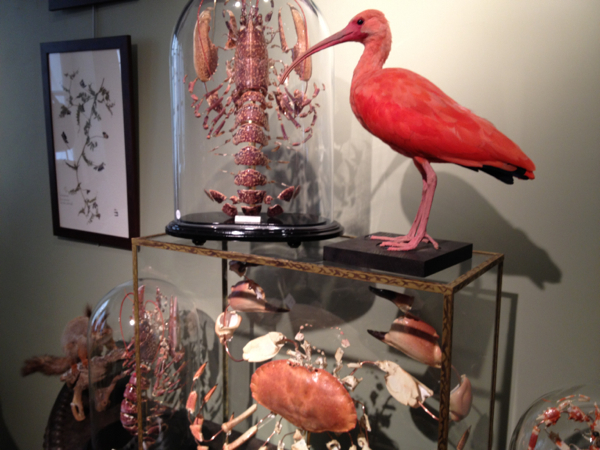 Anne Orlowska, the mistress of this dazzling place, used to own, together wither her sister Nathalie, the legendary taxidermy boutique Deyrolle on Rue du Bac. When her sister pursued other interests, Anne had to sell her part too. But she decided to continue and opened her own boutique a few years ago. 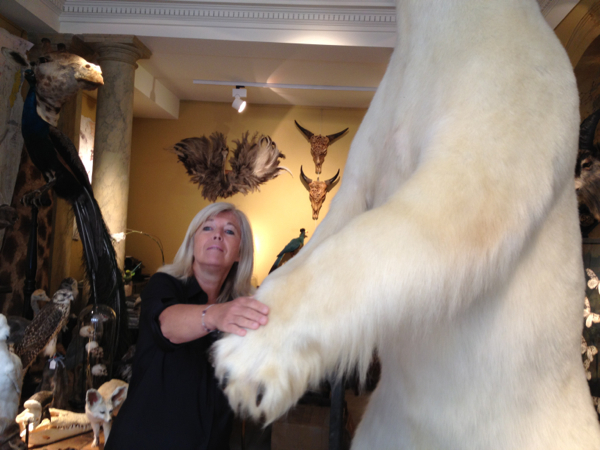 Meanwhile Anne Orlowska lends her beasts to Harry Winston or Yves Saint-Laurent for photo shoots. 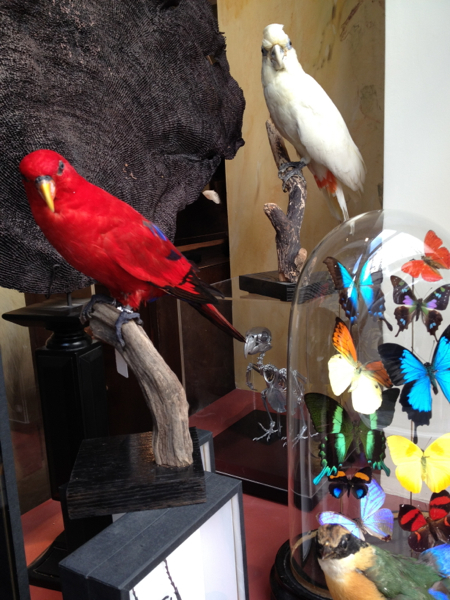 And since taxidermy has become very fashionable in Paris, famous fashion designers, decorators and interior architects count among her clients. All animals, she insists, died in captivity, and the zoos and circuses she works with all respect the guidelines set down in the Washington convention. “I like to think that we are giving the animal a second life”, she says. The day when I visited Nature et Design two impressive creatures where just about to leave: the huge polar bear and an impressive tiger. Who has bought them? None other than the king of Morocco. The price? Something between 20 000 and 30 000 Euros per animal. But for clients like this it’s definitely not about money.